An essential element in upper level dressage, the piaffe embodies ultimate collection with exquisite grace. A distinct art deco appeal grants Ellington an air of sophistication and this inspired jeweler Jeni Benos to name him after a renowned big band artist. 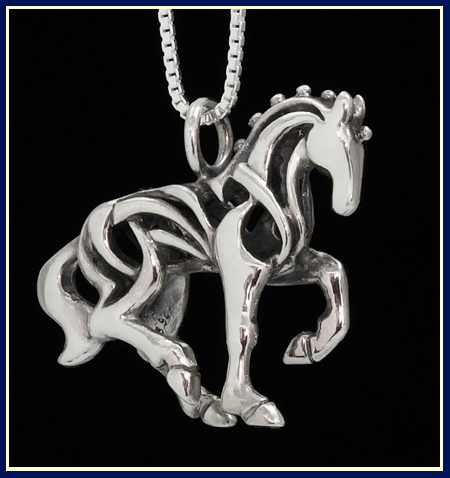 The name being appropriate to the style of the design while tying in a connection to musical freestyle, one of the most creative and graceful components of the equestrian arts. Ellington involves some of Jeni’s more complex and unusual processes of mold making for a hollow seamless form. 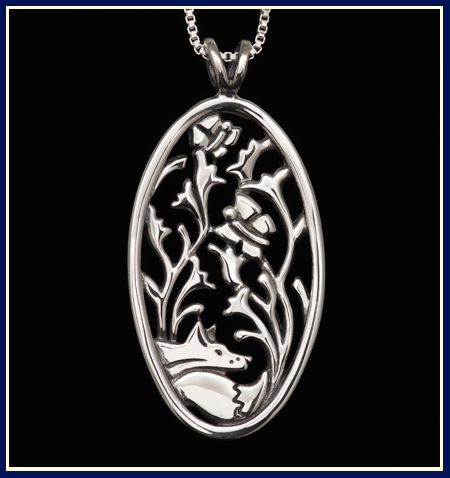 Hand carved over countless hours and well worth the effort, this exquisite sterling silver piaffe necklace possesses a warmth that can only be created by the hand of a skilled artisan. 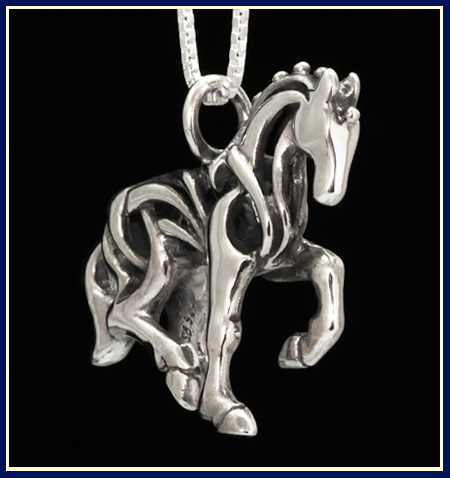 Accuracy of the technical aspects of the piaffe was a primary concern for Jeni as she created this striking equestrian pendant. 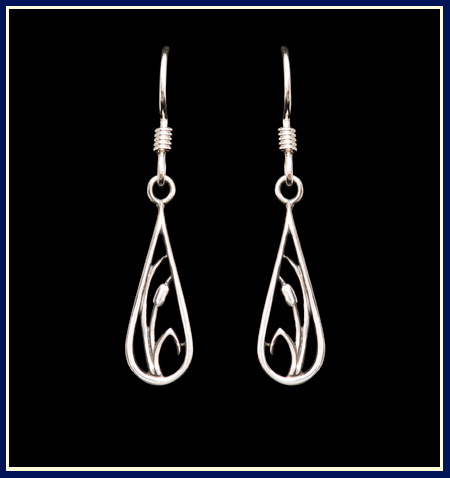 Precision is paramount in dressage and jewelry making alike. 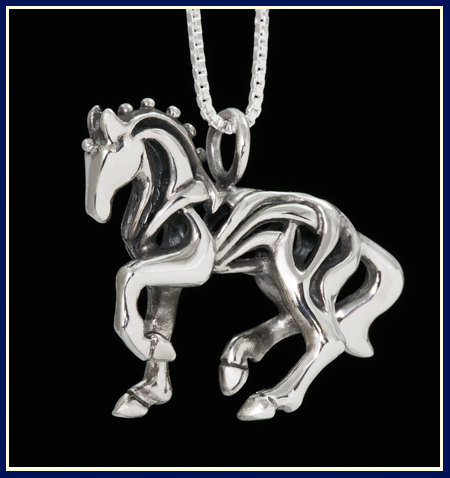 Jeni’s experience with and passion for horses and the equestrian arts allows her to capture movement, energy, and personality in her horses’ attributes clearly seen in her piaffe necklace. An essential element in upper level dressage, the piaffe embodies ultimate collection with exquisite grace. 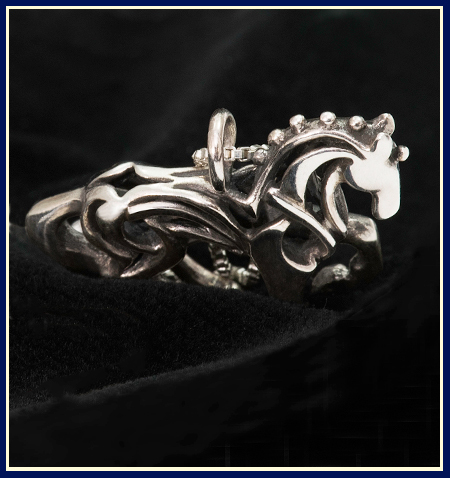 This equestrian ballet movement demands suppleness, precision and exceptional training. The elevated trot in place requires the horse to sink deep onto his haunches and lighten his front end while maintaining a round frame and soft connection to the rider. Rhythm and cadences with a degree of suspension are also fundamental to the piaffe. A distinct art deco appeal which grants Ellington an air of sophistication inspired jeweler Jeni Benos to name him after one of the most renowned big band artists of the 1940’s. Art deco being a style that developed and flourished during the 1940’s Jeni felt it only appropriate to choose a name reminiscent of that particular time period. Jeni has always been drawn to the distinctive linear styles of art deco design and the pattern defining her sterling silver piaffe necklace strongly evokes this spirit. Jeni initially intended to simply choose a name that was popular during the time frame when art deco styles were prominent; however, her musical taste is quite diverse ranging for classical to grunge and most things in between. Listening to big band era swing music while carving the silver horse inspired her. Duke Ellington was one of the most influential big band artists of the time, and of course his name is also quite distinctive. Therefore, she decided to pay tribute to a great musician while tying another important aspect of dressage into the piece as well. Musical freestyle dressage performances are some of the most enthralling to watch and could be considered the most creative and beautiful of the equestrian arts.